When Mrs James rescued a little brown bunny called Peanut, she was told that Peanut loved to hide under sofas, didn’t come when called, and didn’t like rabbit food. What she didn’t know was that Peanut had a passion for cake, and if she put her mind to it she could eat a whole slice of apple tart, which is a human dish, NOT rabbit food. Peanut was well known in the rabbit world for loving cake. She could sniff a piece of cake from a great distance. She knew the sound of all cake wrappers. Peanut’s sweet tooth and cake radar were indeed legendary. Sweetpea and the foster bunnies always came when called at dinnertime, but Peanut had to be called over twenty times before she came to the dining area, looking for cake. When Mrs James gave her rabbit food, Peanut twitched her little brown nose as if to say, “Bo-ring!” or “cake please!”. One day Mrs James bought some fancy cake called Treat yourself to our delicious apple tart and Peanut’s eyes became the size of dinnerplates. Normally Peanut liked to stay under the sofa, but this time she came running – without being called. Peanut was very excited and hopped round and round Mrs James’ feet, which is what rabbits do when they want something. Mrs James felt a bit dizzy with all that spinning and almost handed over the apple tart but in the end she said, “Cakes are not for bunnies” and took an enormous bite. Needless to say Peanut was very disappointed and retreated under the sofa to plan a cake expedition. Bunnies can be very determined when they love cake, as Mrs James was about to find out. That evening while the bunnies were having dinner Mrs James thought it would be safe to watch TV on the sofa with a slice of Treat yourself to our delicious apple tart. Peanut was sitting quietly under the sofa, too quietly, some people might say, and wasn’t hungry for rabbit food. Mrs James couldn’t wait to eat the apple tart and was about to put the first rather large piece in her mouth when suddenly the TV went blank! It was Sweetpea pushing all the buttons on the remote control with his great big feet. Mrs James left the cake on the sofa for a tiny second while she turned the TV back on. With an amazing leap Peanut pounced on the sofa and made a dash for Treat yourself to our delicious apple tart. Before Mrs James could say “Hey!” and “Cakes are not for bunn…”, she grabbed the whole slice and carried it bravely under the sofa. Peanut gulped the cake down as fast as she could without any help from the other bunnies. Meanwhile the foster bunnies watched Peanut in action and Sweetpea thought maybe he could eat the crumbs in future. Peanut was feeling a bit sick after all that cake, but it was worth it, she thought in her bunny mind. But when she tried to get out from under the sofa, she couldn’t because her tummy was too big! After a lot of shuffling Mrs James realised Peanut was stuck and had to lift the sofa to let her out. Peanut ran to the bedroom, quickly followed by Sweetpea, but the story doesn’t end there. Ten minutes later Peanut burped and made smelly number twos all over the carpet. Peanut pretended everything was great, so she wouldn’t have to go to the vet. But Mrs James had already called the petmobile and soon they were on their way to the hospital. The vet said that bunnies should only eat things that grow, like grass, cabbage and pear, not things made in a factory, especially a cake factory. Then she gave Mrs James a medicine to put in Peanut’s water. When they got home Peanut went straight to her bunny napper, looking very sheepish. It was “No more cake” from now on. The next day Mrs James bought a big selection of fruit and veggies to see which ones Peanut liked best. 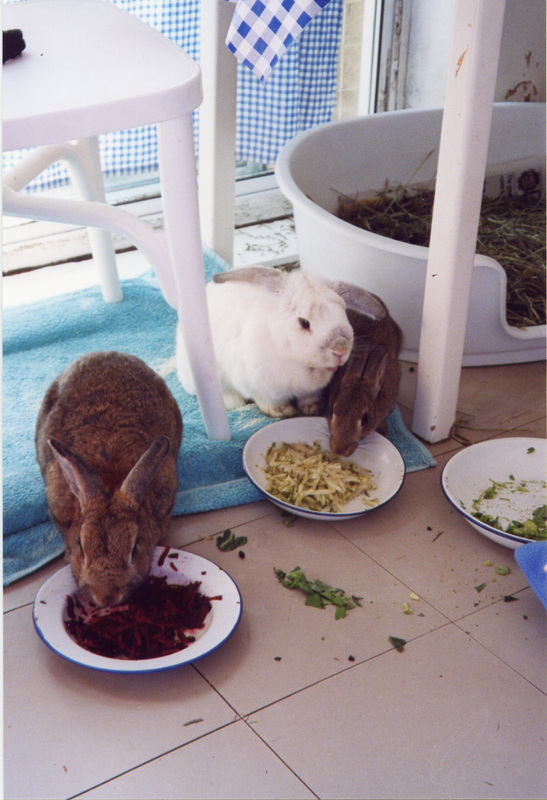 First she prepared a mouth-watering parsley, chicory and babycorn salad on a bed of grated carrot as featured in Women and Bunnies magazine. She gave it to Peanut and waited with bated breath. After a bit of a sniff Peanut ate it all up and licked her plate and whiskers which means “Yummy!” in bunny language. The second course was a fabulous hay buffet and Peanut and the foster bunnies got stuck in! Finally for dessert there was a big slice of apple (NOT apple tart). She loved it! Peanut had to hurry before the other bunnies ate it all. That day Peanut discovered that rabbit food can be quite tasty and you can train people to buy a variety of fruit and veggies, like mint, watermelon, rocket and basil. She is now the first bunny to come when called at dinnertime, and as a result she is quite big. Mrs James learnt not to leave cakes lying around on the sofa. Now when she wants to eat some apple tart she has to go in the garden, even in winter! What does Peanut do to get the apple tart? What happens after Peanut eats the apple tart? What does your rabbit eat? Tip When you feed your rabbit fruit or veggies he’s never eaten before, only give him a small piece and slowly increase the amount in the next few days, so your bunny doesn’t get a tummyache. Click here to find out the best way to feed your rabbit.